According to Statistics Finland's preliminary data, prices fell by 1.9 per cent in Greater Helsinki and by 3.3 per cent elsewhere in the country from December to January. Of large towns, prices rose only in Vantaa. Compared with the corresponding period of the year before, prices rose by slightly over one per cent in Greater Helsinki and fell by good two per cent elsewhere in Finland. In Helsinki, prices fell by around two per cent in January. 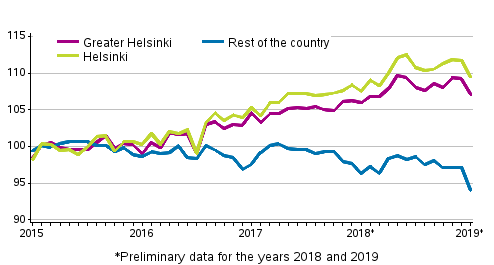 Compared with the corresponding period of the year before, prices have nevertheless risen by around two per cent in Helsinki and by 9.5 per cent from 2015. In the surrounding municipalities, prices remained more or less on the same level compared with December and the corresponding period of the previous year. Compared with 2015, prices have fallen by two per cent. In January 2019, the average price per square metre of an old dwelling in a housing companies was EUR 4,315 in Helsinki and EUR 2,158 in the surrounding municipalities. Preliminary data on price changes in January are based on around 400 transactions in Helsinki and on 137 transactions in the surrounding municipalities. The preliminary data comprise, on average, one half of completed transactions in old dwellings in blocks of flats and terraced houses. 3) Transactions at a lower price than the general price level were made in Turku in January 2018. ISSN=2323-8801. January 2019. Helsinki: Statistics Finland [referred: 24.4.2019].